There are 7 stakes and districts located in the Brazil Natal Mission. The Church is most strongly established in the cities of Natal and Mossoró. Natal is also home to a CES Institute. The growth of the Church in the area, combined with the recent influx of missionaries, led to the creation of the mission in 2013. The area is serviced by the Recife Brazil temple, which is located outside of mission boundaries. As in other parts of Brazil, rice and beans are eaten with almost every main meal. Due to its coastal location, fish and seafood dishes (especially shrimp) are quite popular in Natal. A popular seafood dish is “ginga com tapioca” – a fried fish served with tapioca. Sun-dried meat (called “carne-de-sol”) is also common in desert regions. Couscous is another typical dish in the region, and is either served in a salty form with vegetables, eggs, and dried meat, or in a sweetened form with coconut milk. Cocada sweets (made from coconut and often served with sweetened condensed milk) are popular desserts and street food items. 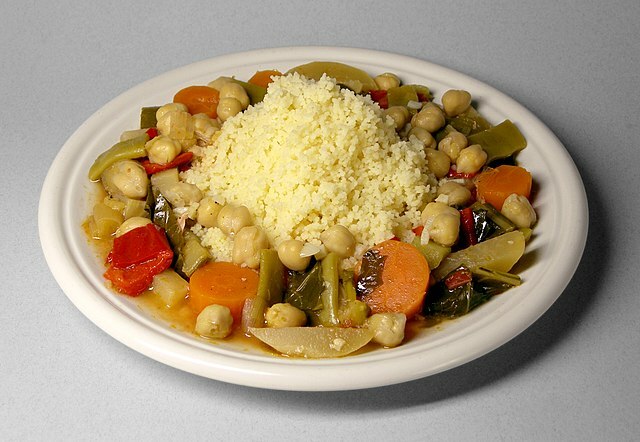 Couscous with vegetables. Photo cca-sa3.0u by Rainer Zenz at Wikimedia Commons. Missionaries serving in Brazil typically rely on walking or using public transportation to get around. Natal’s public transportation system includes buses, vans, and micro-buses, with more extensive routes covering the tourist areas. The Newton Navarro bridge connects the northern and southern parts of the city and has become a tourist attraction due to its large size. The Newton Navarro Bridge. Photo cca2.0g by Mário Monte at Wikimedia Commons. Natal was ranked the safest state capital in Brazil by the Institute of Applied Economic Research of Brazil! Missionaries should still remember to be smart and avoid shadier areas. The Festa Junina (celebrated on the 24th of June) is one of the most popular festivals in the region. The celebration generally runs from the 12th until the 29th of the month, featuring bonfires, music, dancing, and fireworks. Natal means Christmas, and as such, there are several events held around Christmastime in the city. Concerts and plays are popular events, and much of the city is festively decorated. The city also celebrates “Carnatal,” an event similar to Carnaval but held in either November or December. Salgado Filho Avenue in Natal, decorated for Christmas. Photo cca2.0g by Thompson Sá at Wikimedia Commons. Natal is most famous for its beaches and sand dunes, but there are plenty of other sites as well! Natal is home to the largest cashew tree in the world (really), an aquarium, a historic center located in some of the city’s older neighborhoods, and the Forte dos Reis Magos (a Portuguese fort that was built in 1598). Forte dos Reis Magos, with the Newton Navarro Bridge in the background. Photo cca2.0g by Leandro Neumann Ciuffo at Wikimedia Commons. Genipabu sand dunes and beach. Photo cca-sa3.0u by Gerardo Valente at Wikimedia Commons. Climate: Natal's climate is tropical. Temperatures are hot and humid throughout the year, with highs in the 90s Fahrenheit during summer and 80s Fahrenheit during winter. The months of February through July are typically the rainiest of the year. Many other areas in Rio Grande do Norte have more of a desert climate and are significantly drier than the coastal area near Natal. The work is going so well in Brazil that the Church recently created the Brazil Natal mission! Check back in a year to hear what the first missionaries in the Brazil Natal mission have to say!